If you’re feeling tired of getting nowhere, trapped in a dead-end job, or frustrated with outdated job search methods, this book may be your ticket out. In eight information-packed chapters, Catherine Beck shares the techniques taught in her successful job and career search workshops, takes the mystery out of looking for a job, and opens up new opportunities for career enhancement. It’s Your Career—Take Control! 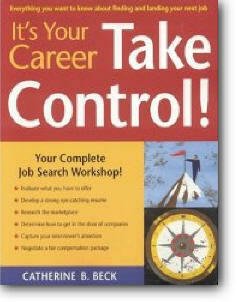 is a complete, up-to-date job search workshop in a book. It covers everything you need to know—from self-assessment, resume writing, and job market research to interviewing and negotiating your compensation package—providing practical exercises, tips, sample forms, and case studies at each step along the way.